Spring Glen Woods is located in Spring Glen, New York. We are 90 miles from NYC. You can get here by taking the Palisades or Route 87, and it’s a beautiful drive. There is a bus from Port Authority that takes you within walking distance of the bungalows – Coach USA / Shortline Bus. 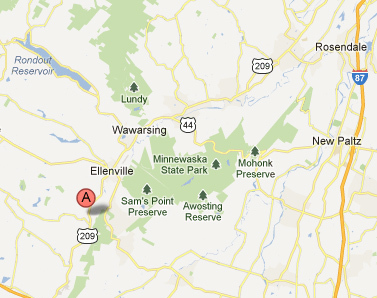 There’s also a NJ Transit train that takes you from Penn Station to Middletown, NY, about 25 minutes from Spring Glen.